New HTM M390 Torpedo Gunhammers are Here! After the overwhelming success of our first run of Exclusive M390 Gunhammers, the KnifeCenter is extremely excited to see the new batch of these awesome tactical knives come in with the Torpedo style blade shapes. Available in either serrated or honed, spring-assisted or manual opening, you now have the choice between a tactical black DLC coated blade or an attractive Stonewashed finish. If you choose to go with a manual opening knife but are not familiar with the Maxx Glide Pivot System these knives utilize, you’re in for a pleasant surprise. This ball bearing design is exclusive to knives by Darrel Ralph and it really does close the speed gap between assisted and manual knives. With little to no wrist action, the blade flies open using the thumb studs or flipper mechanism and locks up solidly with the overly-thick titanium lockbar. M390 Steel from Bohler is an excellent performance steel balancing corrosion resistance and extremely high hardness (62HRC) which provides superb wear resistance during hard use cutting. You can check out these new M390 Gunhammer models exclusively at www.knifecenter.com. 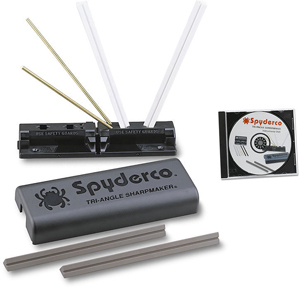 Spyderco Close Out Specials Are Here! ’tis the season for savings and here are some of the best deals of the year from one of our favorite manufacturers. 26 newly discontinued Spydercos are on sale at close out prices while their supplies last. It’s your time to save some cash on a wide variety of excellent designs that we will be sad to see go. Check them out at www.knifecenter.com. Just released for 2012 and now available at the KnifeCenter are the three limited edition Kershaw Blurs. These include two DLC coated models with a Purple or Green spider web pattern handle and a Carbon Fiber model with a beautiful stonewashed finish. The 154CM steel blades come razor sharp and fly open with just the slightest pressure to the tapered thumbstuds. Light jimping on the spine and frame, paired with an ergonomically curved handle make this knife extremely comfortable to use for extended cutting tasks. Limited production of 700 Pieces for the Green, 550 pieces for the Purple, and 850 pieces for the Carbon Fiber – get these highly collectible and ultra cool designs before they’re all gone. Available at www.knifecenter.com. 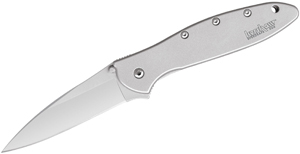 Quartermaster Knives QTRM5TR Are Here! Introducing a new brand of overbuilt, well made, tactically designed edged tools – Quartermaster Knives – also known as QTRM5TR. Taking Mantis Knives to the next level with all USA-made products (and components), they’re doing it right and they’re doing only a limited number of each model. Every knife is individually serialized and hand checked to make sure only the finest combat cutlery is leaving their shop and hitting our shelves. Utilizing CPM154 for their first production runs, every knife incorporates QTRM5TR’s proprietary ORB® pivot system which is a smooth as any available on the market today. It makes actuating the large and small blades QTRM5TR uses a breeze and can be adjusted with the same Torx bit as all the rest of the screws on the knife. Check out these awesome new blades at www.knifecenter.com. Introducing the 25th year anniversary edition of the original frame lock folder – the Sebenza. The hole in the middle of the face scale is gone making for simply a better looking knife. The extra finger contour is the most noticeable difference on this model but it’s inside where all the real change has happened. The handle screws and pivot are now larger to wear better over time. The washers are absolutely gigantic and fit with extra holes for better oil distribution resulting in a smoother opening blade. The thumb ramp has been redesigned with a much larger curve so it’s actually functional now and really locks the knife in the hand. Finally, the attached blue lanyard and bead really are just a cherry on top. It’s an absolutely stunning knife built to the quality Chris Reeve is famous for. This is a Prototype, serial number 22 of 25, and is hand signed and dated by the legend himself – Chris Reeve. 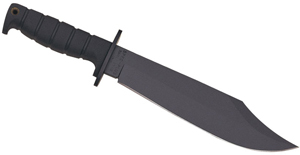 Check it out before it’s gone at www.knifecenter.com. Boker is well known for producing some of the highest quality pocket and fixed blade knives in the world. The Special Edition Evergreen Series with smooth olive wood handles are no exception. The beautifully brushed 440C blades come razor sharp and have an extremely strong detent providing solid lockup. All the handles are nicely rounded and very smooth for a comfortable, ergonomic grip. The inlaid Tree-Brand logo reads ‘Solingen’ underneath symbolizing the quality of manufacturing coming from one of the premier steel capitals of the world. These knives are serial numbered and limited to only 500 production pieces worldwide. Pick yours up for a great price at www.knifecenter.com. Hand Tech Made (HTM) Knives are production versions of custom designs from some of the most well known knife designers in the industry. They feature work by Dirk Pinkerton, Randall King, Kirby Lambert, Greg Lightfoot, and Darrel Ralph. The Gunhammer, with three very different yet capable blade styles, is one of the most successful tactical designs we’ve come across at the KnifeCenter. Available in your choice of serrated or honed, coated or bead blasted, you now have a choice between the spring-assisted opening or the manual version featuring the Maxx Glide system. If you’re not familiar with the Maxx Glide Pivot System, it’s exclusive to designs by Darrel Ralph and it really does close the speed gap between assisted and manual knives. With absolutely no wrist action, the blade flies open using the thumb studs or flipper mechanism and boy does it lock up solidly with the over-thick titanium lockbar. All these great features are available on all Gunhammer models but what makes this Exclusive is the M390 Super Steel we got the folks at HTM to use for this run of knives only. Balancing excellent corrosion resistance and extremely high hardness (62HRC), M390 Steel from Bohler provides superb wear resistance during hard use cutting. Limited to only 30 production pieces per model, pick up your Exclusive M390 Gunhammer today at www.knifecenter.com. DPx Gear, in partner with Italian knife manufacturer LionSteel, is doing some amazing things with their excellently designed HEST Folder. After almost a year of field use gathering opinions, suggestions, and modification ideas, DPX Gear has come out with their Triple Black special edition folder with some serious tactical improvements. The main complaint about their original folder by soldiers serving all over the world was that it just wasn’t tactical enough. The knife lacked serrations and the Titanium lock side and clip were too darn visible and with this simple idea at heart, the new HEST T3 was born. The knife now comes with a tactical black G10 handle scale, a PVD-coated Titanium lockbar, and is free of any discernible markings on the blade or clip. This allows for the knife to disappear into the night and with the sharp biting serrations, it’s possibly the perfect combat theater tool. Another awesome new feature of the Triple Black T3 folder is that the skull shaped adjustment tool now incorporates a built in compass. For it to function correctly, the tool had to be made from a non-magnetic alloy and what better for this than Titanium. Adjust your tactical tool with style and be sure to get yours before they’re gone forever, strictly limited to 500 production pieces. You can find this stout, tactical folder at www.knifecenter.com. The model 940 from Benchmade could very well be the perfect EDC knife. I honestly can’t find a single negative thing to say about it. The materials, craftsmanship, ergonomics, and attention to detail are all absolutely superior. Take all this and multiply it ten-fold for 2012, introducing the Gold Class model 940-121 by Benchmade. This knife, already near perfect, gets a true overhaul sparing no expense by using the best premium materials available on the market. The CPM-M4 super steel blade is finished in a clear protective coat called Cerakote and paired with the green titanium handle and carbon fiber bolsters, it creates a very pleasing look. If you’ve ever handled any of the 940-943 series of knives, you’ll know I saved the best part of it for last; the size. For a blade just a hair under 3.5″ and weighing in at only 3.2 oz., this knife absolutely disappears in your pocket. When closed, the knife is only 1-1/8″ wide at it’s largest point so you can slip your hand, phone, keys, or another knife into your pocket without obstruction. Gold Class knives are truly custom level production blades, see for yourself at www.knifecenter.com.